Escape into Nature with your own private hideaway right in the middle of the rainforest in Diwan. 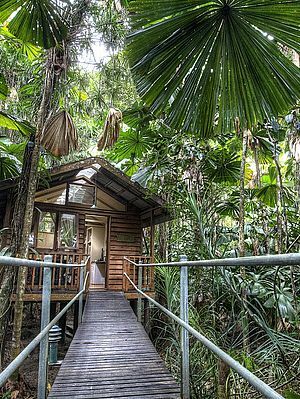 Each cabin falls within eco- accreditation guidelines ensuring we protect the magnificent views, allowing guests to enjoy the animals, sounds and beauty the rainforest offers. 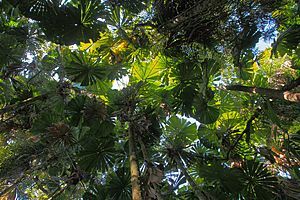 Each cabin features a unique viewing sunroof allowing you to gaze up into the rainforest, filling your cabin with beautiful rays of sunshine in the morning and natural light during the day. 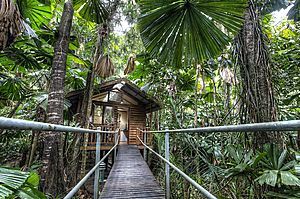 The seven cabins are set a fair distance from the next, all tucked away beneath the canopy and under the beautiful fan palms, offering a “canopy coolness” and privacy within your cabin. 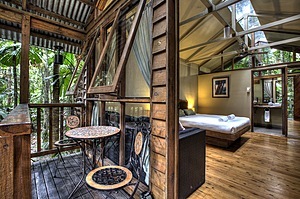 The cabins have been individually named to match the trees and palms found in the rainforest. Three of our cabins offer twin or triple share, the four remaining cabins are certainly more suited to couples. Each of the cabins have a separate en-suite. Our bar is open from 10am everyday. The restaurant is open for dinner from 6pm nightly. We also have snacks available in the afternoons so you can relax in the hot jacuzzi with a cold drink in the middle of the Daintree Rainforest.